Are your feet and toes often cold? Poor blood circulation, known as peripheral arterial disease (PAD), may be the reason. PAD is often the result of an underlying disease, such as high blood pressure, heart disease, diabetes, hypothyroidism, hyper-cholesterol, and anemia. Smoking is also strongly linked to PAD. Peripheral neuropathy may also make your feet feel cold. Common in fair-skinned females, Raynaud's disease makes hands and feet appear blotchy and bluish in cold weather. This may be associated with rheumatoid arthritis, 'Sjögren's disease, or lupus, and is known as Raynaud's phenomenon. Your doctor can check and see if you may have one of these underlying conditions or if you just have cold feet. It may not just be your shoes causing your feet to hurt. Although four out of five women complain of foot pain from their shoes, there may be an underlying condition causing the problem. High heels or poorly fitting shoes can exacerbate common foot conditions such as bunions, neuromas, hammertoes, and ingrown toenails. Postmenopausal women can suffer from osteoporosis, which puts them at a higher risk for a stress fracture, a small crack in the bone. If your toes turn white, then blue, and red again with a blotchy appearance, you may have Raynaud's disease. Exposing your feet to cold temperatures or emotional stress triggers vasospasms that cause a sudden narrowing of the small arteries to the skin of the feet and toes, resulting in Raynaud's disease. Chronic smokers may also have an appearance of blotchiness and changing color of their feet due to peripheral arterial disease (PAD). Plantar fasciitis is the most common cause of heel pain. 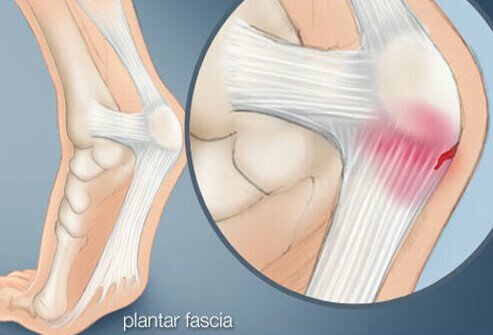 The plantar fascia is a large, broad ligament at the bottom of the foot that attaches to the heel and can become inflamed. This causes a sharp pain in the heel, which may be most pronounced when taking your first steps in the morning or after sitting. Other causes of heel pain are retrocalcaneal Achilles tendocalcinosis (bone spurring), bone prominence (pump bump), stress fractures, bone tumors, infections, bursitis, neuritis, and arthritis. An examination by your physician, as well as X-rays, can rule out many of these conditions. 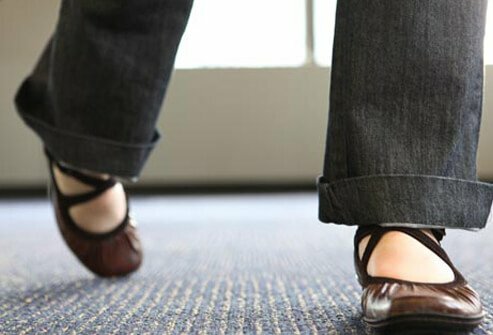 A change in the way you walk may be the first sign of an underlying medical condition. It may manifest itself as a slower or wider gait, imbalance, foot dragging, and tripping. One common cause is peripheral neuropathy, which is a slow loss of sensation that causes numbness and sometimes a burning sensation of the feet. Peripheral neuropathy is most commonly seen in diabetics but may also be a consequence of alcoholism, infection, vitamin deficiency, lower back nerve impingement, or exposure to heavy metals. Clubbing of the toes refers to the structural shape of the toes. Clubbing may also occur in the fingers. The nails are curved and rounded at the top, somewhat like an upside-down spoon. There may be a bulbous appearance of the tip of the toes. The most common underlying cause is lung disease or lung cancer. Other causes are heart defects present at birth, cystic fibrosis, celiac disease, liver disease, thyroid disease, and Hodgkin's lymphoma. In some cases, clubbing of the toes and/or fingers may just be a family trait where no underlying disease exists. Swelling of the feet may be temporary from prolonged standing or sitting in one position. This is particularly common during pregnancy and is usually benign. In contrast, persistent swelling of the feet and legs maybe an indication of a serious underlying medical condition, including cardiovascular problems such as congestive heart failure, poor blood circulation, or venous insufficiency. It may also be a problem with one's lymphatic system (lymphedema). Other causes of swelling are infections (cellulitis), kidney or thyroid disorders, and even a blood clot in the leg. Consult your doctor if you have persistent swelling of the feet. The most common cause of a burning foot sensation is peripheral neuropathy, of which the most common cause is diabetes. Other neuropathies that cause peripheral nerve damage can be from vitamin B deficiency, alcoholism, or exposure to some industrial chemicals. 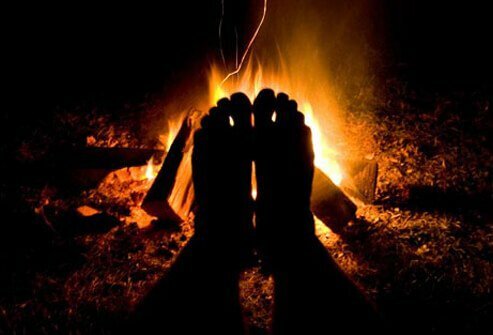 Burning feet may also be a symptom of chronic kidney disease, poor circulation, athlete's foot, contact dermatitis (allergic reaction), or thyroid disease. Sores on the feet that don't heal are a major concern. The three main causes are infection, repetitive abnormal pressure (from bone deformity or ill-fitting shoes), and poor circulation (PAD). Diabetics are particularly vulnerable to nonhealing wounds of the feet because of their diminished sensation, circulation, and healing capabilities. Diabetics should check their feet daily for any areas of pressure or signs of a developing wound. In some cases, nonhealing wounds are due to a foreign body or even a type of skin cancer (malignant melanoma). Nonhealing wounds of the feet should be evaluated and treated promptly by a doctor. The sudden onset of redness, pain, and swelling of the big toe joint is a classic example of gout. However, other conditions may also present in this way. They include hallux rigidus (osteoarthritis of the big toe joint), hallux abducto-valgus (bunion deformity) sesamoiditis (an inflammation of the small bones associated with the big toe joint), fracture, infection of the joint, or even an ingrown toenail. Turf toe, commonly seen in athletes where there is a demand for rapid push-off on the ball of the foot, may also appear with pain and swelling at the big toe joint caused by a straining and tearing of the soft tissues and ligaments. 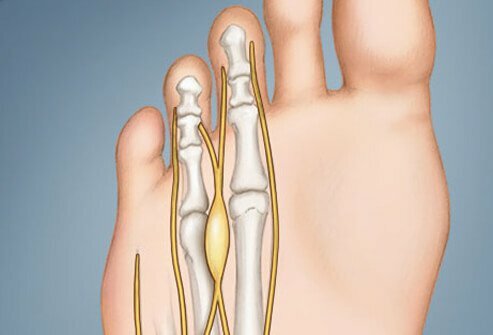 A pain in the ball of the foot that is sharp, burning, numbing, and/or tingling with radiation into the toes may be from a neuroma. Neuromas develop from irritation and inflammation around the nerve, causing the surrounding tissue to thicken and scar. It most commonly occurs between the third and fourth toes of the foot, called a Morton's neuroma. Symptoms can be intermittent and range from subtle numbness to extreme pain. Narrow shoes may be a causative factor and aggravate the condition. It is eight to 10 times more common in women than men. The most common cause of itchy feet is athlete's foot. This is a fungal infection called tinea pedis. It may appear as a scaling red rash at the bottom of the feet and/or painful cracks in the skin between the toes. Contact dermatitis is another common cause of itchy feet. It is caused by a reaction from chemicals, soaps, creams, or even the materials of socks and shoes. Another potential cause for itchy feet is psoriasis, which may be due to an overreactive immune system. In most cases, obtaining the proper diagnosis and applying the appropriate topical creams can be effective in relieving the itch. A claw toe deformity is a curling of the lesser toe joints. It is very similar to a hammertoe deformity but involves all three joints of the toe rather than two. It is caused from muscle and tendon imbalances of the foot and ankle. These imbalances can be from a number of conditions, particularly neuropathies such as diabetic neuropathy, alcoholic neuropathy, or another underlying neurologic disorder. Treatments for this condition include stretching exercises of the toes, functional custom orthotics, extra depth wide toe box shoes, and palliation. In some cases, surgical correction is recommended. That sudden, sharp pain in the foot causing your toes to contract or spread may just be a foot spasm. Foot spasms can be caused from a variety of conditions, most commonly from overuse and fatigue of the foot muscles as well as dehydration. Other causes may be imbalances of electrolytes in your system or deficiencies of magnesium, calcium, potassium, or vitamin D. Conditions that can affect hormone levels, such as pregnancy and thyroid disease, also may be the cause of foot spasms. Keeping hydrated and wearing proper shoes, particularly for athletic activities, can be helpful. Strengthening of the foot's intrinsic musculature by walking barefoot on natural surfaces, such as sand or grass, can also be helpful. Although we commonly associate skin cancer with areas that are more exposed to the sun, they can occur on the feet. Melanomas, the most dangerous skin cancer, can be found on any area of the foot, even between the toes and under the toenails. Dark spots under the toenails are often subungual hematomas (blood accumulated under the nail), however, a melanoma can appear very similar. Onychomycosis is a fungal infection of the nails that causes discoloration and thickening of the toenails may cause yellow toenails. 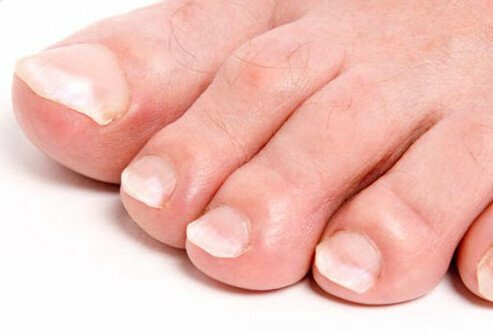 Other causes of yellow toenails can be diseases such as lymphedema, arthritic conditions, lung disease, or even repetitive trauma to the nails from tight shoe gear and stop-start athletic activities. Koilonychia can have many causes. One of the more common is iron-deficiency anemia. Exposure to industrial solvents and chemicals may also cause the toenails to grow upward in a spoon shape. Certain systemic diseases, such as systemic lupus erythematosus, hypothyroidism, and Raynaud's disease, may also be the culprits. Many conditions can cause white nails. One of the more common is psoriasis, which can affect the appearance and texture of the nails. Yeast and fungal infections may also cause the nails to appear white. Trauma to the nail from an injury or ill-fitting shoes can sometimes lead to an accumulation of fluid that lifts the nail and gives it a more white appearance. In some cases, white nails may be indicative of a more serious underlying condition, such as liver disease, diabetes, or congestive heart failure. Consult your doctor if your nails appear abnormally white. Nail pitting is most commonly seen in people who suffer from psoriasis. Approximately 50% of people who suffer from psoriasis will have pitting of the nails. 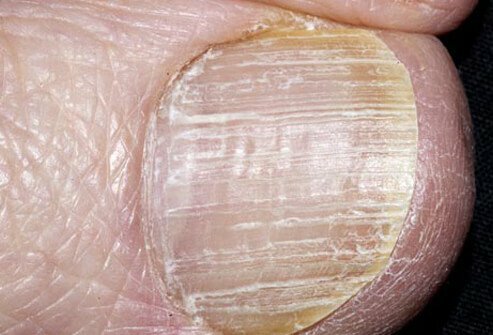 Trauma to the nail growth plate or nail bed can also cause a pitted appearance with ridges. Sarcoidosis and bacterial and/or fungal infections may also cause pitting of the toenails.